Along the North Shore of Staten Island Bethlehem Steel’s World War II-era shipyard in New York was located at Mariners Harbor, near the northernmost tip of Staten Island, at the south end of Newark Bay and within sight to the west of the Bayonne Bridge, from which many destroyer completion photos were taken. Founded in 1889 as the merger of Burlee Drydock company and Port Richmond Iron Works, it was renamed Staten Island Ship-building in 1907 and moved from Port Richmond to its World War II location in 1925. As United Shipyards Inc., it launched the first two Mahan-class ships, Mahan and Cummings in 1935 and two modified Mahans, Dunlap and Fanning, in 1936. No further destroyer construction commenced until December 1940 when, as Bethlehem Steel, the yard began continuous production of an eventual 44 more ships, 39 of which were completed during the war. Concurrently, the yard also produced landing craft, cargo vessels and three ocean-going tugs. Fastest from keel laying to launching was destroyer-minelayer Shea at 144 days. Three destroyers shared the yard’s record for keel laying to commissioning: 261 days. During WWII this shipyard produced many ships that helped the United States win this war. This shipyard employed hundreds of Staten Islanders as ship builders. The shipyard closed production in the 1960’s. Ms. Brodericks Dad Worked in this shipyard as a welder. 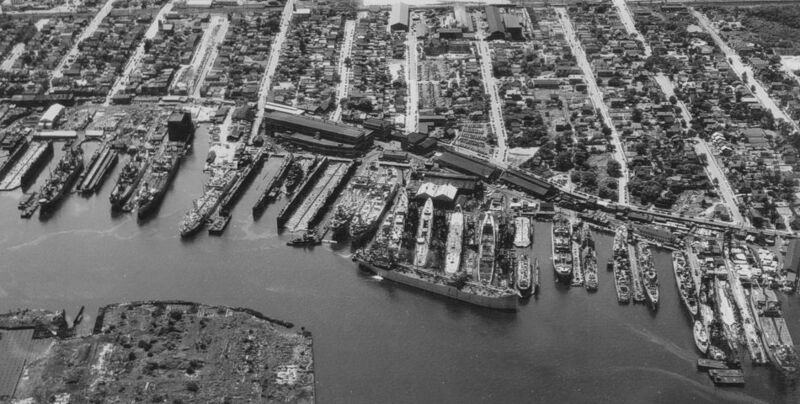 They built ships in this Mariners Harbor Ship yard to help fight WWII. The built 44 ships. In World War II they were building ships right on the North Shore of Staten Island to fight in the war. This started in 1940. At that time people were very poor even starving because they had no jobs. The ship yard gave them work and helped them win the war. Are there any records of ship repairs in 1942, looking for details of the Tanker Geo W McKnight,badly damaged by U66,wifes Uncle was 1st mate,later Captain,the ship was hit by two torpedoes and had a 60ft x 30ft hole in her side and took five weeks to repair.